Ever since visiting the Henry Knox Museum in Thomaston, Maine, we at the New England Historical Society have grown fascinated with clerestory windows. As twilight starts in midafternoon during the long New England winters, a clerestory brings in much (and much-appreciated) light. Technically, a clerestory is a high section of wall that contains windows above eye level to bring in fresh air as well as light. Sometimes people confuse them with widows walks, at least from outside. Here, then, are six historic buildings with a clerestory. If you know of another notable building with a clerestory, please include it in the comments section. 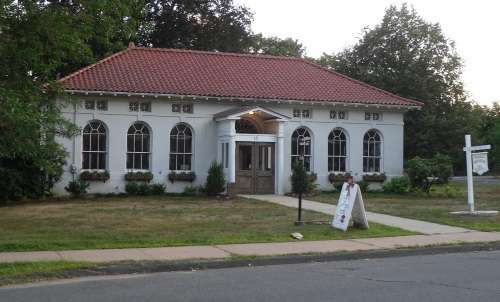 West End Library, Farmington, Conn. This mini-version of the Boston Public Library has something the BPL doesn't: clerestory windows. The National Park Service calls the old West End Library in the village of Unionville in Farmington, Conn., ‘an unusually intact example’ of the nearly 2,000 libraries Andrew Carnegie gave away. Today it looks much as it did when built in 1917: Even the toilet room in the basement is original. Back around the turn of the century, cities and towns rarely supported public libraries with tax dollars (few, by the way, still do). Local library organizations had a hard time finding a place to store their books. So Andrew Carnegie, the steel tycoon, gave away all of his fortune, mostly to libraries. He singlehandedly doubled the number of public libraries in the United States, giving away 1,689. Of those, 95 were in New England. All but three are still standing, including the West End Library in Farmington. A nationally renowned architect, Edward Lippincott Tilton, designed the old West End Library, finished in 1917. Like many Carnegie libraries, the West End Library is a miniature version of a famous large library: in this case, the Boston Public Library. But unlike the Boston Public Library the West End Library has clerestory windows directly above the main arched windows in the front and back. The building operated as library until 1968, when it became a senior center. Then in 1984 the town leased it to the nonprofit Unionville Museum. The National Park Service called the library ‘a testament to small-town civic achievement.’ It has significance not just as a historic building but as a contributor to the character of the surrounding village of Unionville, a historic district since 1978. 15 School St, Unionville, Conn. This house has a gambrel clerestory, once popular in New England. Now only two remain. Capt. George Tate served as Maine’s last mast agent, overseeing the cutting and shipping of white pine trees to England for the Royal Navy’s masts. Tate may have thought the plum job set him up for life, but things began to go south for him. Tate, born in 1700, moved with his family to the colonies around 1750s. 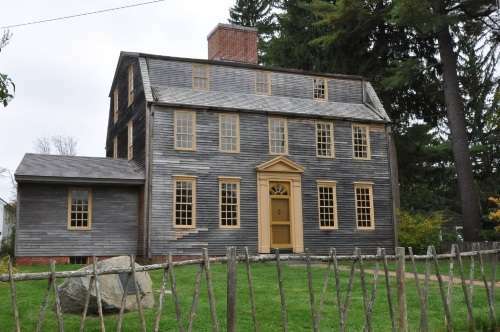 He built himself a fine house in 1755 in what is now the Stroudwater Historic District, a section of Portland cut off from the rest of the city and containing many 18th and 19th-century homes. The king’s first mast agent in Maine, Col. Thomas Westbrook, settled Stroudwater. He built some of the roads, a dam, a bridge, and sawmills and gristmills -- in short, an early industrial village that thrived on the processing of white pine trees. Tate brought paneling and wainscoating from England; the unpainted clapboard exterior disguises the lavish interior. 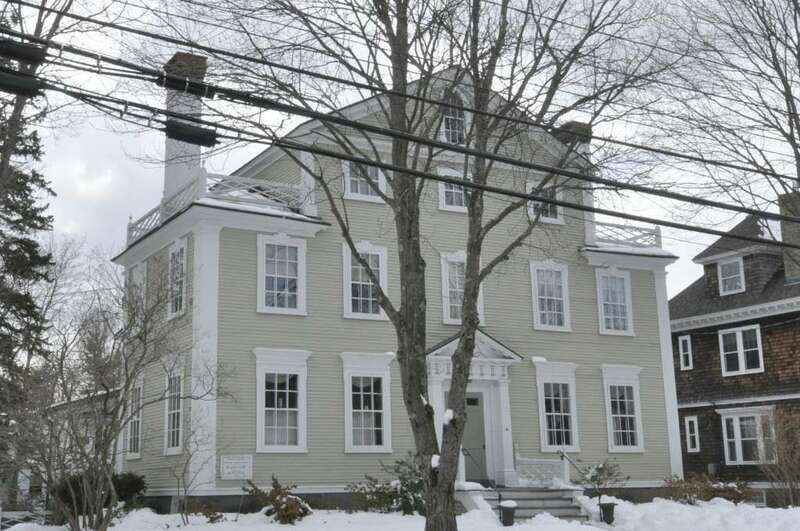 The Tate House has a clerestory gambrel roof, once a common form of colonial architecture. Only one other survives in New England, in the Burnham Tavern in Machias, Maine. Mary Tate was killed by a booby trap set by her son William to catch thieves. William was convicted of her murder but was later pardoned by George III. Then, of course, revolution broke out, in part due to resentment of the king appropriating the colonies’ white pine trees. George Tate lived to be 94, dying in 1794. The house opens to the public in the warmer months. 1270 Westbrook Street, Stroudwater neighborhood, Portland, Maine. The clerestory in this barn let in light for milking cows and fresh air for preventing hay from combusting. Shakers established Hancock Shaker Village in 1791, the third of 19 started between 1783 and 1836 Closed in 1960. Built in 1820, the barn at the Hancock Shaker Village was probably the first round barn in the United States. A model of efficiency and clever design, the barn has three levels, each with a specific use. The Shakers designed the big fieldstone barn for 52 cows, but it can hold 70. Once constructed, it attracted visitors, including Nathaniel Hawthorne and Herman Melville, who raced each other on foot inside the building. After a fire, the Shakers replaced the conical roof with a clerestory that let in light and fresh air, which prevented the spontaneous combustion of wet hay. A ramp takes wagons filled with hay to the third level; because the barn is round, the wagons never have to back up, they simple circumnavigate the barn and exit through the same door they entered. From the third level, Shakers could pitch hay to the cows on the second level, where they were milked. The cows’ heads fit into stanchions so they could feed while they were milked. At the cows’ rear ends, the Shakers built trap doors so they could easily shovel manure into the first level. They let it accumulate until they spread it on fields for fertilizer. 34 Lebanon Mountain Rd., Hancock, Mass. Samuel Tenney House, Exeter, N.H. The clerestory in this Georgian house came from an English pattern book. The Samuel Tenney house at one time or another involved five well-known New Hampshire figures: Dr. Samuel Tenney, who tended wounded soldiers at the Battle of Bunker Hill; his wife Tabitha, the first best-selling author in America; Tristan Shaw, U.S. congressman; Ebenezer Clifford, inventive master carpenter; and Bradbury Johnson, builder-architect. Samuel Tenney built the house around 1800 where the courthouse now stands. Born in 1748, he served as a surgeon to the army to the end of the American Revolution. George Washington appointed him acting surgeon general at Valley Forge. After the war he had a long and distinguished career as a judge, U.S. congressman, author and scientist. Tabitha Tenney was the best-selling novelist in the country for the first half of the 19th century. Her novel, Female Quixotism, poked fun at the illusions of romance. Published in 1799, the book was still in print when Harriet Beecher Stowe wrote Uncle Tom’s Cabin. Ebenezer Clifford and Bradbury Johnson together built several landmark buildings in Exeter, including the First Parish Church, the second Phillips Exeter Academy building and the Atknson Academy building. The two men creatively adapted designs from English pattern books as the gabled clerestory in the Tenney house shows. Clifford, by the way, built and designed a diving bell that he used in the Exeter River. Finally, U.S. Rep. Tristran Shaw lived in the Tenney house in the early 19th century. The house was moved to its current location on High Street to make way for the courthouse. 65 High St., Exeter, N.H.
Upper Rockville Mill, Hopkinton, R.I. The clerestory in this Rhode Island textile mill let more workers work longer. The Upper Rockville Mill, built in 1844, typifies the granite mill buildings that dotted Hopkinton, R.I., in the 19th century. What’s different about the Upper Rockville Mill: It used water power well into the 20th century, and didn’t stop making textiles until the late 1980s or early 1990s. The Rockville Manufacturing Company built the big granite mill on a hill in 1844, and ever since it has served as the town’s most prominent architectural feature. Like many Rhode Island cotton mills, it had clerestory windows that allowed more natural light and usable work space in the mill's attic. Two years later the Seventh Day Baptists built a church, and from then on village life revolved around the mill and the church. Seventh Day Baptists owned the mill, and everyone who worked there belonged to the church. As many as half the workforce were women and children. The mill made cotton yarn, cloth, fishing line, twine and cord. Since it relied on water power, it could never expand too much, but it could survive for more than a century. 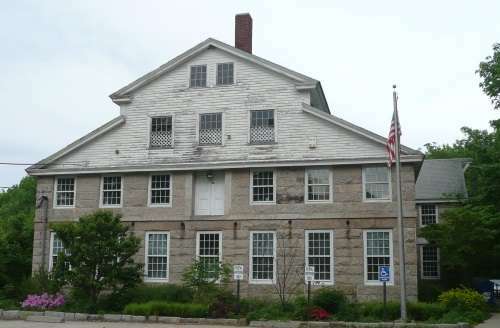 Today the National Register of Historic Places lists the Upper Rockville for two reasons: It demonstrates the rise of the textile industry in New England, and how that industry created many mill villages in rural towns. In 1850, Hopkinton alone had more than a dozen mill villages. 332 Canonchet Rd., Hopkinton, R.I.
Christ Episcopal Church, Montpelier, Vt. The neo-Gothic Christ Episcopal Church reflects Montpelier’s growth and prosperity after the Civil War. The parish in 1868 replaced an old frame church built 30 years earlier with a substantial stone building. It had both a 100-foot tower and spire and a stained-glass clerestory window, a key feature in Gothic churches. The building, though, suffered repeated damage. In 1903, a fire ruined the roof and the interior. Then in 1927 the flood that devastated Vermont also devastated the church, undermining its structural integrity. Though the parish repaired the church, it had to remove the spire in 1963. Then in 2015, a crane collapsed and crashed through the roof. Once again, the church required repair. 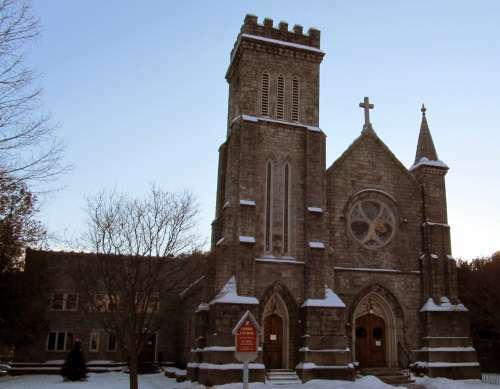 Today Christ Episcopal Church stands as one of five historic churches built in Montpelier between 1865 and 1873. All survive and belong to the Montpelier Historic District. 64 State St., Montpelier, Vt. 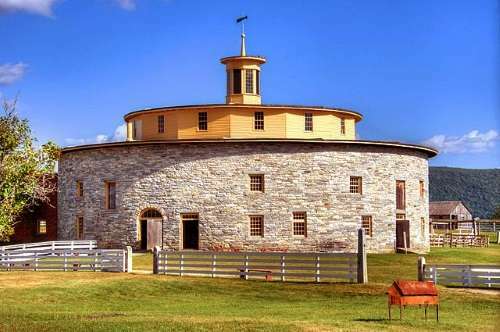 Images: West End Library By Doug Kerr from Albany, NY, United States - Unionville, Connecticut Uploaded by Magicpiano, CC BY-SA 2.0, https://commons.wikimedia.org/w/index.php?curid=29970923; Round barn at Hancock Shaker Village: By Bestbudbrian - Own work, CC BY-SA 4.0, https://commons.wikimedia.org/w/index.php?curid=51387903; Samuel Tenney House, By User:Magicpiano - Own work, CC BY-SA 4.0, https://commons.wikimedia.org/w/index.php?curid=25270039; Christ Episcopal Church By John Phelan - Own work, CC BY-SA 3.0, https://commons.wikimedia.org/w/index.php?curid=18509487; Tate House By User:Magicpiano - Own work, CC BY-SA 4.0, https://commons.wikimedia.org/w/index.php?curid=28918831. ; Upper Rockville Mill By Tmac02892 - Own work, CC BY-SA 3.0, https://commons.wikimedia.org/w/index.php?curid=6897440. The first building in this article is in THOMASTON Maine, not Thomasville. Please correct this. Thanks for pointing out the error. We’ve corrected it.